So a while ago I went down to Cornwall and packed a cushion foundation. Now, I've never actually bought one because I watched Gothamista's DIY Cushion foundation video and have since made my own. I'm going to share what I've done, even though this time hasn't been that successful and I've just ended up using more concealer for a base during my trip than to use this cushion foundation. I will note the mistakes at the stages where I feel like I've made and do a lil mini conclusion at the end - hopefully this will help! 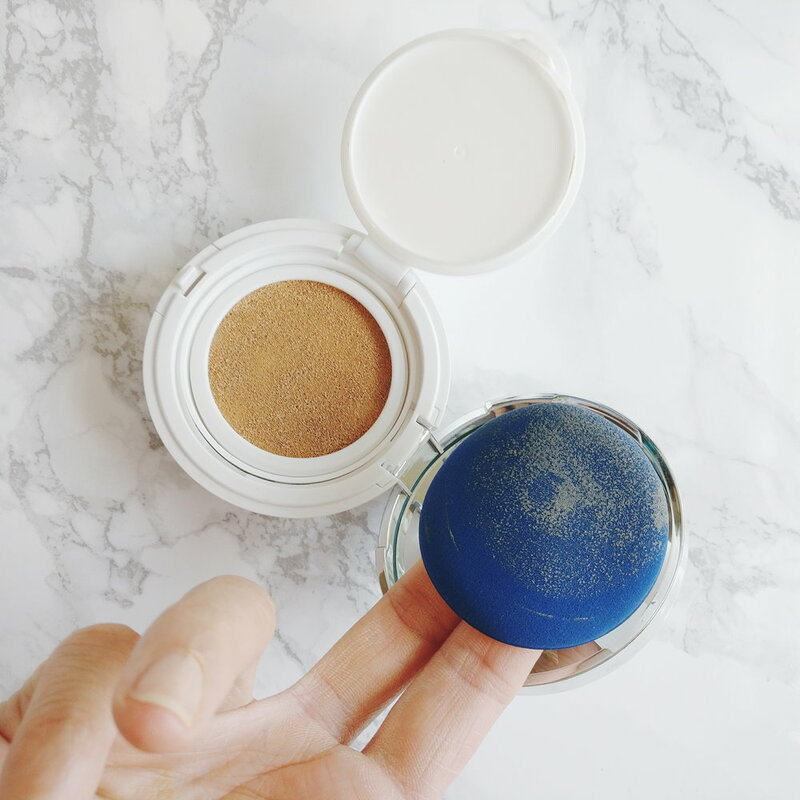 So with all DIY cushion foundation, you need the empty case. This could be your existing one. I washed out my sponge but I believe you can actually buy them? If anyone knows where though, let me know! I also sprayed and wiped my case down with rubbing alcohol to disinfect it. 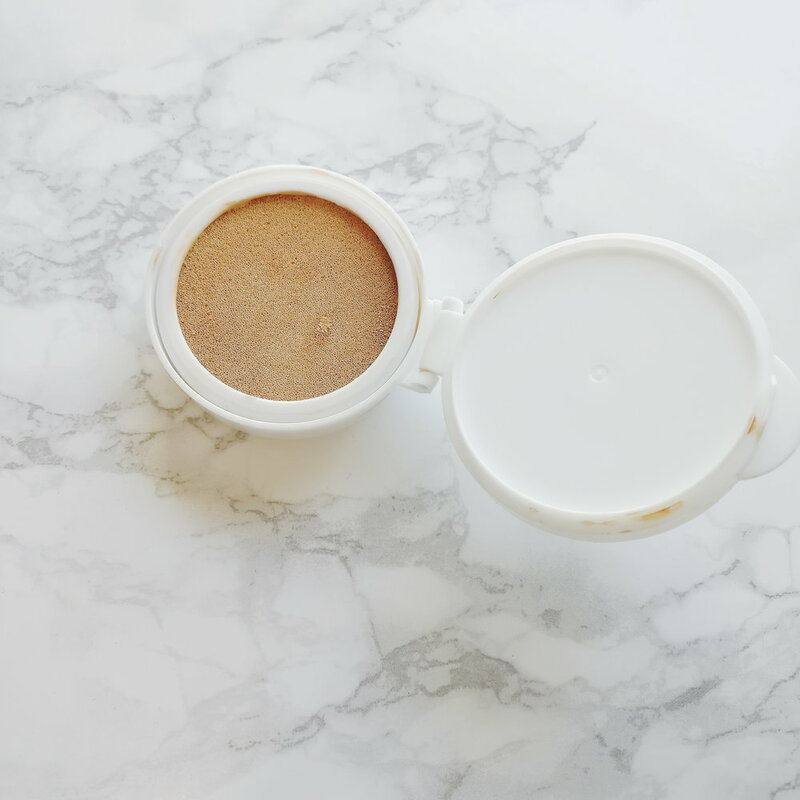 After your container is clean, it's time to choose what products you want to go in your foundation. I'm trying a new foundation and an old BB cream to see how it'll work. Normally I mix foundations to see which one suits my skin tone the most; I've used/mixed different combinations from 3 different foundations (Vichy BB cream, Bourjois Healthy Mix Foundation, The Ordinary) to see which one would fit me the most and went with the Vichy BB Cream (lightest) and The Ordinary (darker, with a yellow undertone). 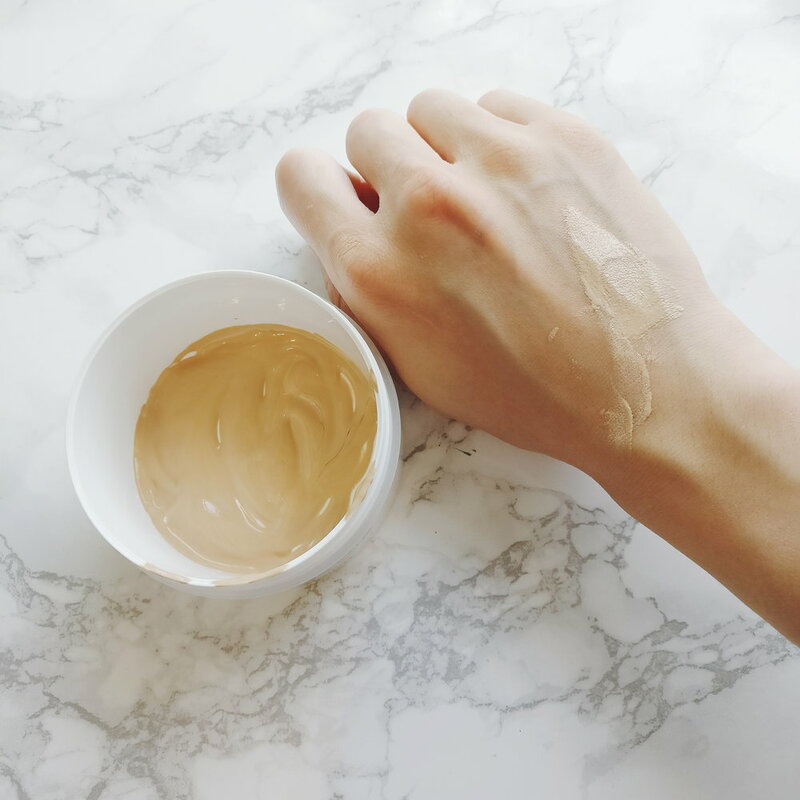 Korean cushion foundation often have skincare qualities too and if your don't, you can always create one that does. I've added Hylauronic Acid and a Vichy serum (sample size) as well. The ratio of skin care to foundation is 1:3. I've also added a touch of illuminating primer from Primark to make the foundation a little more dewy. When you've selected the products, it's time to mix it all in. 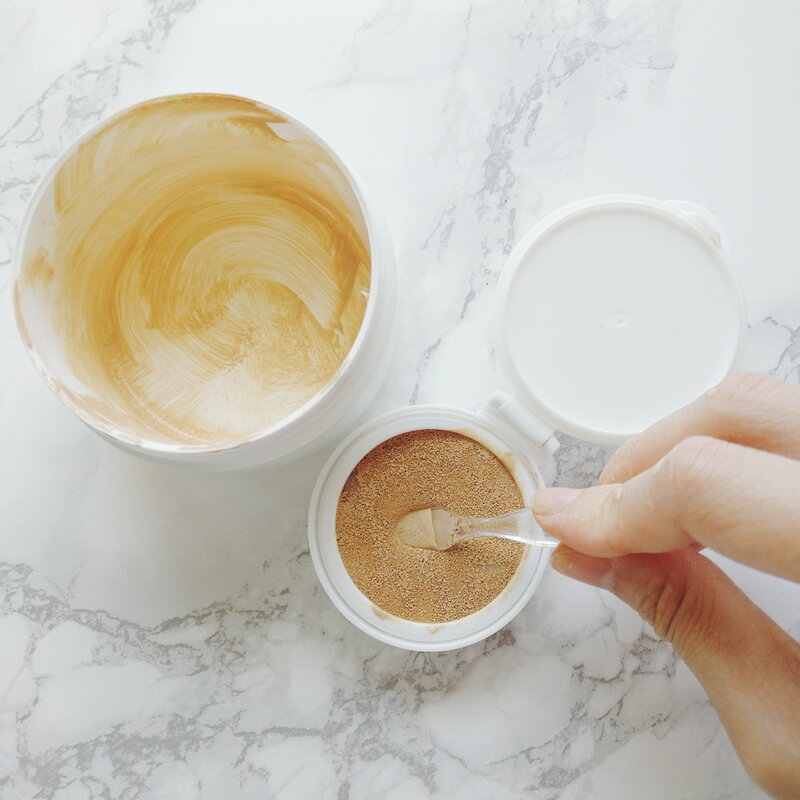 I would recommend mixing the mixture elsewhere first before adding it to the container, especially if you're doing a new concoction of products. So here (below) I am swatching what illuminator I should add in, and then doing final swatches to feel the texture on the skin as well as checking that the colour works before pouring it in the cleaned container. 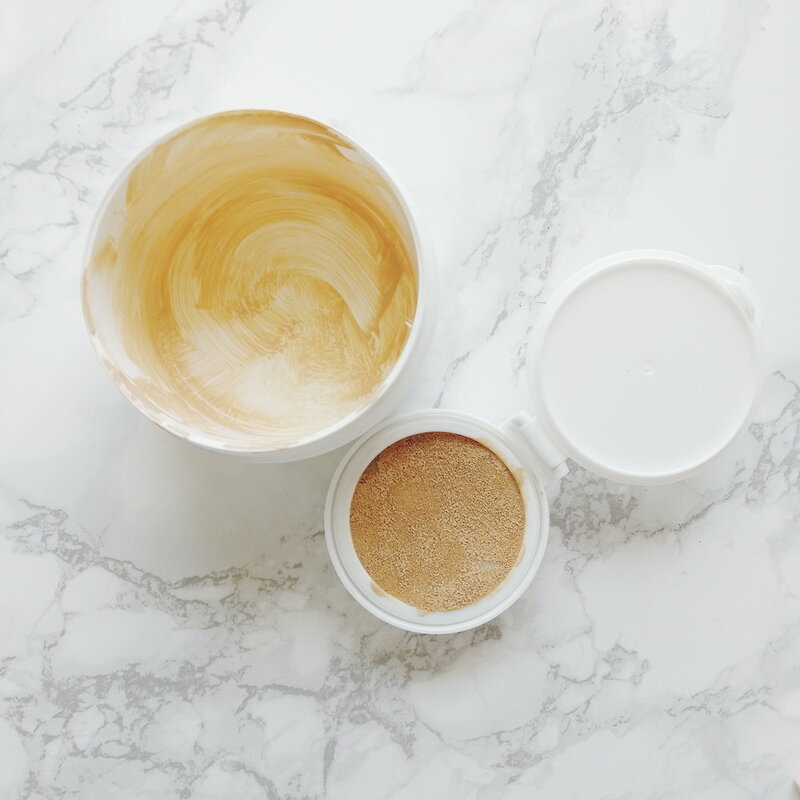 Mistake #2: I haven't actually used enough products (foundation in particular) for my mix and found that it was harder to get product into the sponge and on to the appilcator afterwards. I didn't usually have to dab my sponge a million times, but this time I did and it could be because there simply wasn't enough product poured in the container. You should only really fill it a third up full though otherwise they will leak. 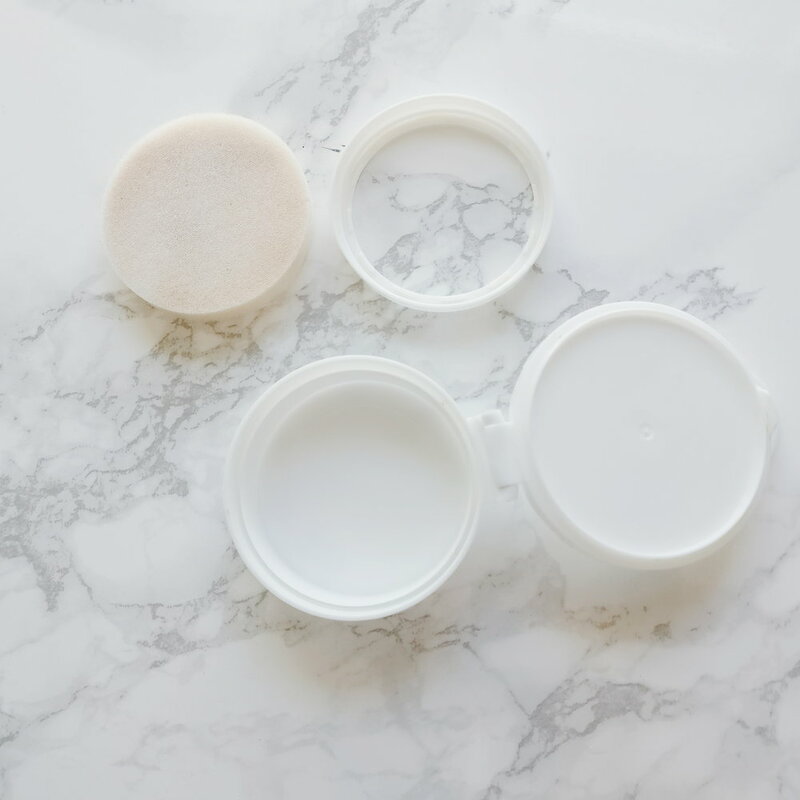 Use that sponge to scoop up the rest of the product with both sides and then push the sponge into the clean container, pressing with the spatula to soak up the products from the bottom of the container. And there you have it, It is genuinely that easy. The hardest part is getting the products right and having the right amount in the pot. After you're done, pop it back in the outer "frame" and test it with the sponge applicator. using an old sponge that I've washed out the product from. I felt like it worked, but perhaps it hasn't - the integrity of the sponge is questionable after washing, or maybe my sponge being a relatively cheap one hasn't done well like some other better ones. not using enough products. You can tell I definitely haven't filled up a third of the container, and whilst all the product is in the sponge, I feel like it's harder to get the product out. It shouldn't technically be the case as all the product should be within, but for some reason it hasn't worked well this time round and felt that it's dried up a little since using it.